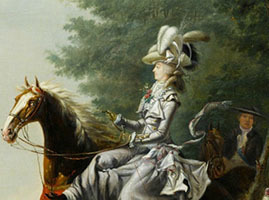 Born in Italy to the famous House of Savoy, Maria Teresa of Savoy-Carignan became Princesse de Lamballe through an arranged marriage to one of France’s richest heirs. The marriage transported her to the gold-leaf and glittering chandeliered halls of the extravagant Château de Versailles. There, she soon found herself immersed in political, sexual, and court scandals. She watched the intrigue as Versailles’s plotters and planners sought, at all costs, to gain the favor of the King and Queen. A loyal and faithful friend of the Queen, the Princesse sought to be the best of what royalty could be, yet she was unavoidably swept up in the tides of change. Despite her personal ebbs and flows with the Queen, the increasing weakness of the monarchy would allow the Princesse to ultimately show her true strength. The eighteenth century was a crucial time in the history of France. The teenaged Louis XVI took power in a time of philosophical, political, and economic upheaval. 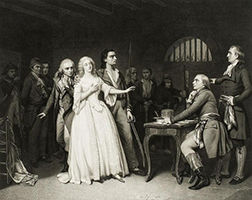 France was in dire financial straits, and while the generally passive Louis XVI butted heads with Parlement, he failed to effectively resolve France’s financial problems and food shortages. Meanwhile, the Queen and the Princesse de Lamballe indulged themselves with sledge rides, winter balls, and grand feasts. Outside their cloistered world, dissatisfied and starving masses clamored for change—changes that would transform both the political and financial structures of France, eventually overturning a monarchy that had existed for three centuries. Their story is both particular to the times and generalizable to situations that occur in the modern world. The story is critically important not only because it tells of a time that gave birth to modern democracy but also as a cautionary tale about what happens when the whole of society is not well served. When one class of people becomes privileged over another, and the division increases, the stability of society itself is threatened. In the case of King Louis XVI and Marie Antoinette, the monarchy seemed to go blithely on, trying to preserve what was while the cracks widened. As frequently occurs in times of dramatic change, there are those who try to hold on while others demand progress. Sometimes, this results in violent upheaval and collapse, as happened in France. Perhaps the fall was precipitated by the King and Queen’s particular foibles, or perhaps it was inevitable. Only those who study history can tell. The book focuses on the interactions of the royals during the final days of the Ancien Regime. Told primarily through the perspective of the Princesse de Lamballe, the book also provides stories and anecdotes of the lives of Marie Antoinette and King Louis XVI leading up to the collapse of the monarchy. This book reveals the Princesse de Lamballe’s version of these events, based on a wide variety of historical sources. It also captures the waning days and grisly demise of the French monarchy in the late 1700s. The story immerses you into a world of titillating sexual rumors, blood-thirsty revolutionaries, and hair-raising escape attempts. It is a must read for anyone interested in Marie Antoinette, the origins of the French Revolution, or life in the late 1700s.